Research shows the negative impact of chronic stress on your love life, but these small steps can bring you back together again. Like many health care professionals with intense jobs, my partner Sabrina rapidly burned out after working as a therapist for two years at a mental health clinic. The chronic stress of seeing as many as 12 patients a day for 50 minutes each — often foregoing lunch and even bathroom breaks to meet the demand —not only wreaked havoc on her immune system (she was frequently sick) and exhausted her emotionally and mentally, but our relationship took a major hit, too. Sabrina seemed to drift further and further away from me, retreating into a world of quiet turmoil. Her sweet disposition turned morose and silent, especially in response to my need to discuss and process what she — and we — were going through. She lacked energy to do things like socialize with friends, exercise or partake in activities she used to enjoy, like going to museums and movies. Simple chores, like taking out the trash or doing the laundry, became points of contention and fell to me to do. At one point, she broached quitting her job, but that wasn’t a financial option for us. In the midst of all this, she was caring for her 80-year-old father before his death. Her stress seemed to reach out in every direction like tentacles, gripping and strangling every facet of our lives together. Eventually, a sad thought crept into my consciousness: Are we going to make it? 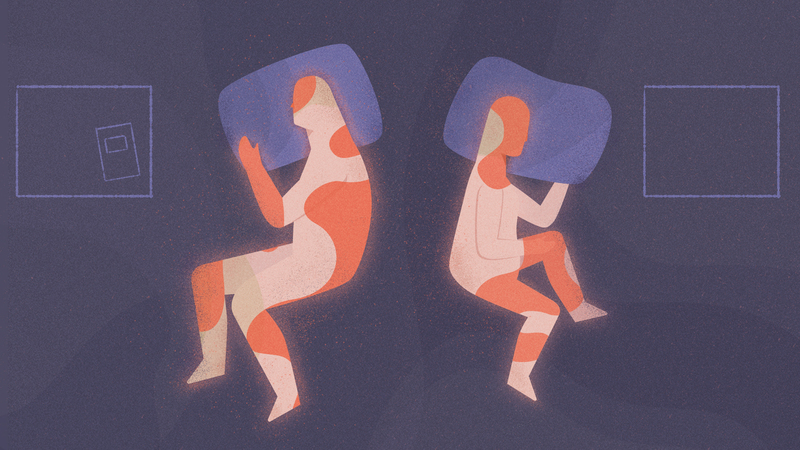 As conversations around burnout become increasingly inescapable in our culture, it’s worth diving deeper into how extreme stress affects our romantic bonds — and how to protect them from reaching the breaking point. Stress is such a major risk factor for unhappiness in relationships that researchers have made it a significant area of study. A recent review showed that stress challenges a person’s ability to manage relationship conflicts constructively and robs couples of the time and focus needed to cultivate intimacy, which threatens marital longevity and satisfaction. “Stress eats away at the resources we need for effective relationship behaviors,” Lisa A. Neff, Ph.D., a professor in the department of human development and family sciences at the University of Texas at Austin and the lead author of the paper, tells Thrive Global. “Couples report spending so much time devoted to solving the stressors, they have less time for each other — less time for expressions of affection like date nights and intimacy,” she says. As a result, stressed individuals are more likely to engage in negative forms of communication like being more critical, angry and impatient toward their partners, she says. “The research makes it clear and imperative that we include the couple’s perspective in burnout studies, and not just see it individualistically, because it’s something that affects the whole family, especially the partner,” Beate Ditzen, Ph.D., a professor of medical psychology and psychotherapy at the University of Heidelberg in Germany, tells Thrive. Ditzen’s research hints at hope that couples can limit the toll of stress on their relationship by implementing small actions that have a big cumulative impact over time. Last month, she published a study indicating that nonverbal forms of intimacy — hugging, holding hands, caressing — reduced stress hormone cortisol in 183 heterosexual couples. It’s one big interconnected loop: stronger relationships, crucial to our overall well-being, also help us cope better with stressful events, which leads to improved sleep quality, according to a newly published study, co-authored by Chloe Huelsnitz, a doctoral student in the department of psychology at the University of Minnesota. Physical affection and even eye contact have proven benefits for a couple’s well-being, especially in the face of stress. These three actions will help you tap into them. “Research shows that holding your partner’s hand can make you perceive less pain,” says Huelsnitz. Whether you’re walking through the city or lounging side-by-side on the couch, she encourages us to incorporate this small, but impactful expression of affection into our daily exchanges. A hug a day keeps the stress at bay, suggests Ditzen, whose work demonstrates the power of touch. Studies show that hugs help reduce stress and negativity in interpersonal conflicts. It’s a simple, sweet way to cultivate home harmony and unity. “Individuals can be aware that they’re behaving differently because they’re stressed out, but it’s hard for them to stop it,” Neff explains. She suggests the less-stressed partner remain cognizant of the pressure their spouse is under and help to defuse and deescalate negative interactions. That means, ultimately, being the bigger person if you know you’re partner’s struggling, Neff says. Confronting what Ditzen calls “medium intense stress” earlier in your relationship can fortify a couple’s ability to overcome more serious forms of stress later in their partnership. “You can build on what you’ve already achieved as a couple,” she says. Remembering how you triumphed over past challenges together can help you two bounce back from your current stressors, too. “If a person is burned out, they don’t have the physical or mental energy to manage everyday tasks or errands,” Salminen says, suggesting that the partner with more inner resources might lighten their stressed counterpart’s load by temporarily taking on more household chores like doing the laundry or cooking dinner. It doesn’t have to be a time-intensive or expensive, or add to your stressed state. It can be as simple as an after-dinner walk for ten minutes or waking up a pinch earlier to watch the sun come up, anything you don’t normally do. “When you first meet your partner, you’re doing all of these new things together, which helps you learn about yourself and them. The feelings associated with that lead to falling in love,” Huelsnitz says. In fact, research has shown that doing new (and fun) things with your partner enhances relationship satisfaction and increases the quality and longevity of relationships. Looking back, one of the ways I could have helped Sabrina would have been to allow her to take some time to herself after a draining day at the office, instead of pummeling her with questions and concerns. A study of air traffic controllers out of U.C.L.A. found that on days when controllers suffered more stressors (ie. a larger number of incoming flights or poor weather conditions) they were more likely to disengage from family interactions in the evening. If their spouses let them have some space, it helped them in the long run. “They were able to recoup their resources and not take it out on their partners,” Neff says. Sabrina eventually found a job she loves with more reasonable demands and slowly began to recover from two years of burnout. Our relationship gradually went back to normal too. The struggle taught us a lot about ourselves, and armed us with the skills to better manage life stressors as we move into our next decade together as a couple.